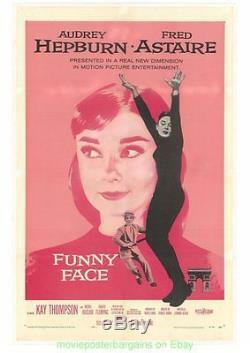 FUNNY FACE MOVIE POSTER Original 27x41 Linenbacked VF 1957 AUDREY HEPBURN. The 1957 musical stars Fred Astaire and Audrey Hepburn. They all have some airbrushing as you can see in the photo to cover the crease wear and some may have minor paper replacement on the edges but all have been restored to cover their minor flaws and look stunning and restored to a seemless beautiful piece ready for framing. These photo's neither one of them look anything like the poster in person. The top one has the saturation turned up a bit in photoshop. Don't ask me what i mean by that , as you won't be getting a answer , your suppose to get it - that little photo's on a computer screen aren't much for conveying the actual appearance in person, neither of them are accurate. There is not much airbrushing on them, just the usual amount to make the white borders perfect and cover any crease wear as you can see in this scan. This poster in person is uniform in appearance to the naked eye really and you can't see any evidence of airbrushing at all, unlike the contex's scan here somehow accentuates from the difference in texture I suppose. I don't sell unlicensed reprints, especially by misrepresenting them as original , all auctions are for theatrical distribution studio issued one sheet size 27 by 40 inch original movie posters unless otherwise noted. For 90% of my auctions UNLESS the rates below are different - TAKE A LOOK!! RUSH ORDERS - LIKE NOT O. ABOUT THE POSTER PHOTO'S. SOME EXAMPLES -A DATE IS CHANGED AT THE BOTTOM OF THE POSTER FOR THE RELEASE OF THE INCREDIBLE HULK BUT THE ONE I SENT WAS THE OLD DATE HE DIDN'T WANT. THE SHERLOCK HOLMES I SENT WASN'T THE ONE THAT HAS HOLMES FOR THE HOLIDAY'S TAG LINE ON IT HE WANTED. I GUARANTEE THE ARTWORK MATCHES THE PHOTO BUT NOT EVERY NUANCE BETWEEN THESE VARIOUS PRINT RUNS THAT THE STUDIO'S PUT OUT - SO THE PHOTO WILL CORRECTLY MATCH THE POSTER'S ARTWORK YOU RECIEVE BUT MAY HAVE A DIFFERENCE IN THE TYPE ON IT. More than just a pretty picture. Make your listings stand out with FREE Vendio custom templates! Get FREE counters from Vendio today! The item "FUNNY FACE MOVIE POSTER Original 27x41 Linenbacked VF 1957 AUDREY HEPBURN" is in sale since Friday, April 3, 2015. This item is in the category "Entertainment Memorabilia\Movie Memorabilia\Posters\Originals-United States\1950-59". The seller is "movieposterbargains" and is located in Van Nuys, California.